Cream the butter and sugar in a bowl using a electric beater or whisk till it becomes lite. 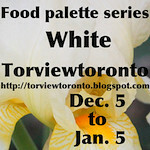 Sift the all purpose flour, corn flour, baking powder and salt together and keep it aside. 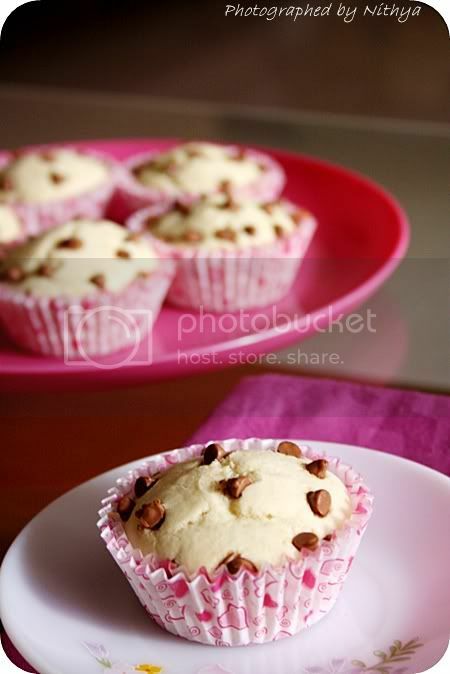 Mix in the vanilla extract to the milk and add the milk and flour alternatively to the creamed butter beating it well. Once all the milk and flour is incorporated, beat continuously in medium speed for two mins. Finally add the chopped tutti frutti to the cake batter and mix it just once. 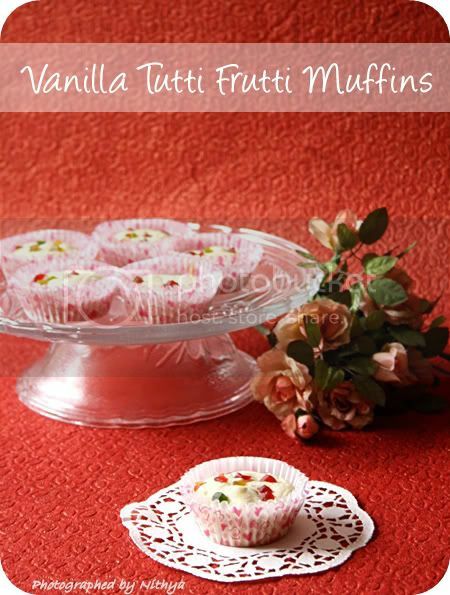 Fill muffin cups upto 3/4th and sprinkle some tutti frutti on top as well. 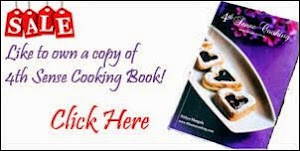 Bake it for 20 mins at 375°F or 190°C. Adjust the time according to your oven settings. Check if cooked by inserting a tooth pic in the center. Once done, allow it to cool on a wire rack for a while. 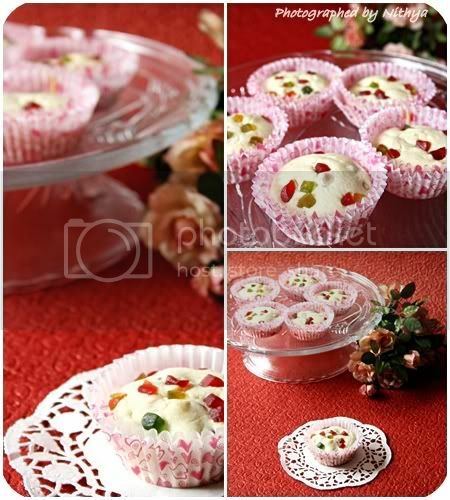 ABsolutely gorgeous looking muffins, both looks incredibly awesome..
cute muffins....usually beautiful presentation and click! Beautiful and tasty Kid Pleaser!!!!! They look so beautiful and good. Looks absolutely lip smacking .. Great pics too !! wait! wait!! i will be "JULIE" oneday, to start following you..hmmm.. your recipes are sooo tempting, that i will start making one by one very soon. Everything is beautiful nithi...I am really tempted. 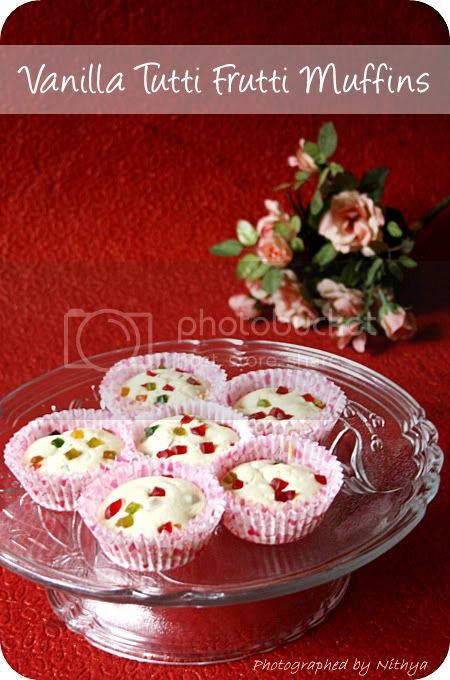 Luks divinefull and colorful ,nithya..i wish i cud have some now..
Super cute muffins..absolutely delicious and unique presentation. Looks absolutely lip smacking ..
looks perfect and colourful love it.Can i grab whole bowl dear. 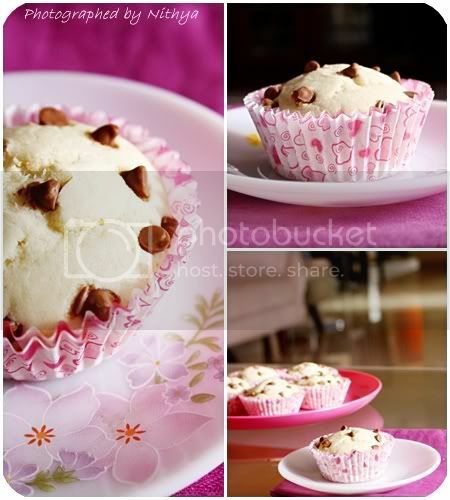 Pretty muffins,I love tutti frutti muffins the best :)Pretty clicks too! The fourth snap is amazing .Nice angle.Yummy cake .Very tempting nithya. FEDx a batch to me! 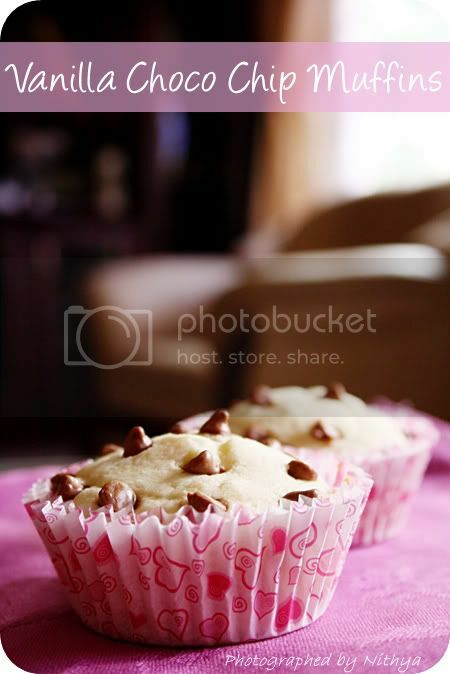 Cute, soft and delicious looking muffins. And egg less too! Hey nits,wondering where you are ?How come you have access to all the ingredients ?Lipsmacking muffins . I wish.... I was your neighbor!!!!!!!!! !